"This word, hitbonenut, is the reflexive of the root bin, meaning "to understand." It is from this root also that the word binah, meaning "understanding," is derived. Hitbonenut literally means "making oneself understand'; that is, contemplating something so deeply and completely that one makes himself understand it in all its aspects. The connotation of hitbonenut- contemplation - is to gaze and stare at something, either visually or mentally, until one understands it thoroughly. 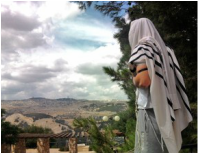 "Contemplate the love of G-D" (Psalms 107:43). When a person intensely focuses on or gazes at (in her inner mind's eye) so intensely on G-D (or perhaps, G-D's manifestations in the world) that her own ego-self recedes and an awareness of G-D comes to the forefront, she can become, as Nachmanides taught, 'an abode of Shechinah.' Living in this state, as an abode of the Shechinah, was likely what the psalmist described when he wrote the beautiful words of yearning expressed in Psalm 27. It is what we might call a contemplative state of being." Contemplation leads to, or rather is the experience of, transcendence - that is, of forgetfulness of self and of everyone and everything else except the contemplated object." Rabbi Yaakov Yosef of Polennoye, a great Hasidic teacher, once said that one aspect of the excellence of the early Sages was that while they were engaged in mundane work with their physical limbs, their minds and souls were simultaneously attached to G-D [and G-D's Torah]. For contemporary Jews, living a contemplative life means using our limbs and all the parts of our physical beings to be fully engaged in the world, while having our souls and hearts attached to G-D. If more of us were to do so, we can only imagine how much better the world would be.